Congratulations to Dr. Lai-Sheng Wang on being named an American Association for the Advancement of Science Fellow. The AAAS is the world's largest general scientific society and publishes the journal Science. The AAAS gives the distinction of Fellow to members who have made efforts toward advancing distinguished science applications. Wang and the other recipients will be recognized at the Fellows Forum during the AAAS national meeting in Boston in February. 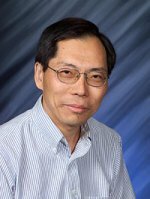 An Affiliate Senior Chief Scientist at Pacific Northwest National Laboratory and a professor at Washington State University—Tri-Cities, Lai-Sheng Wang was selected for distinguished and innovative contributions to the field of atomic clusters and for pioneering work on gaseous multiply-charged anions. Wang and his colleagues uncovered a class of gold atom clusters that are the first known metallic hollow equivalents of the famous hollow carbon fullerenes, known as buckyballs. Each cluster is a sphere of between 16 and 18 gold atoms, arranged in triangular configurations. At more than 6 angstroms across, or roughly a ten-millionth the size of this comma, each cage is nonetheless roomy enough to hold a smaller atom. Other investigations led by Wang have demonstrated that the most stable form of gold clusters undergoes shape transformations. This finding has addressed a key issue in fundamental cluster science: understanding the structural evolution of clusters from a single atom/molecule towards the bulk solid. The work has potential applications in energy research. In addition, Wang has pioneered the study of multiply-charged anions and solution molecules in the gas phase and developed novel experimental techniques to address fundamental questions of ion solvation and solution chemistry. During his 20 years in research, Wang has written or co-written more than 260 publications. He is active in the scientific community, working with the American Chemical Society, American Physical Society, Materials Research Society, and the American Association for the Advancement of Science.